Big Poppa Eats: Truth in advertising or "What is in a name?" On 9th Street between First Avenue and Avenue A you will come across this sign. 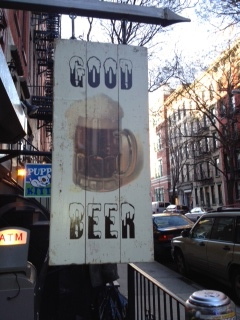 "Good Beer." 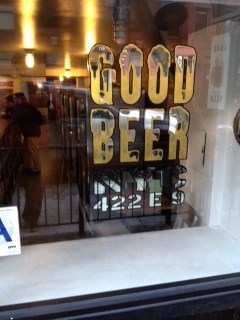 Walk down a few steps and you will enter into the store simply called "Good Beer." Indeed. Good Beer is a store dedicated to finding and carrying good beer from small and independent American Brewers as well as a few well chosen imports. The store has a deep selection of bottled and canned beers. It also has twelve beers on tap that they constantly rotate and update. Growlers are available (a growler is a half gallon glass jug that can be filled from a tap and sealed to take home). You can also try a flight of four beers on tap, getting a chance to sample the diverse mix of the brews they carry. Craft brewers are well represented of course. They have a good selection of my favorite, Abita, including bottles of their SOS (Save Our Shore) brew. New York breweries like Six Point, Coney Island and Kelso are well represented. But lest yea think they are craft snobs, they also have choice selection for those fans of rescued classic brands like the legendary Narragansett (they carry the 'gansett Lager and Light). Of course, when enjoying some good beer one likes to enjoy some good food as well. Good Beer has you covered. A small but nice menu of charcuterie, cheese and sausages are available to snack on while enjoying a nice Allagash White, North Coast Brother Thelonius or Sly Fox Odyssey IPA. The staff at Good Beer is friendly and knowledgeable. No intimidation factor here. They are beer fans who want to turn you onto some good beer. I bet they have a few ideas about what to drink while watching the Giants play the final game of the year. After you swing by, let me know what that Clown Shoes Brown Angel tastes like. I am curious. Good Beer - 422 East 9th Street between First Avenue and Avenue A.
Hello Guys, Here we are going to provide you the best portal for free firefox download free online and this web browser is very smooth for working. This web browser is of latest technology and has advanced features, settings which not only make your work easier but also increases your knowledge. If you used this web browser for once surely you will be loving it. Once go for these games. That sounds good i will surely go and check out this place, here i have few helpful articles for free Yahoo mail users to take a quick action. Hey friends if you want to fix window 10 sound issue for free online then must try nosoundwindows10 its best.